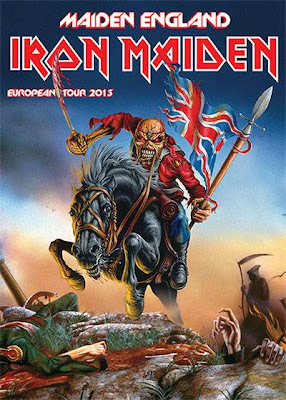 On July 13, 2013, Iron Maiden’s "Maiden England" tour will hit Sweden, where the band will play at Friends Arena, the new national stadium in Stockholm. The Maiden date is the first rock show ever to be announced at this brand new 50,000-capacity venue. Tickets will go on sale on Tuesday, October 2 at 9:00 a.m, with an exclusive first ticket pre-sale for Iron Maiden fan-club members which will run from 10:00 a.m. on Saturday, September 29 through to 6:00 p.m. on Sunday, September 30 (local times). Fan-club members will also be eligible in the draw to be "First To The Barrier." "It is a great honor to be the first rock band to be announced to play the new national stadium, especially as we have always had a very close connection with your country and have massively enjoyed every visit,” says Maiden frontman Bruce Dickinson. The Stockholm show is the second date of Maiden’s 2013 European tour to be announced, following news that the band will headline the UK’s Download Festival on Saturday, June 15.